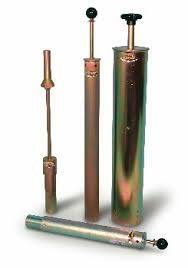 CBR is the ratio expressed in percentage of force per unit area required to penetrate a soil mass with a standard circular plunger of 50 mm diameter at the rate of 1.25 mm/min to that required for corresponding penetration in a standard material. The ratio is usually determined for penetration of 2.5 and 5 mm . When the ratio at 5 mm is consistently higher than that at 2.5 mm, the ratio at 5 mm is used. The following table gives the standard loads adopted for different penetrations for the standard material with a C.B.R. value of 100%. For Railway Formation purpose, the test is performed on remoulded specimens which are compacted dynamically. The methodology covers the laboratory method for the determination of C.B.R. of remoulded /compacted soil specimens in soaked state. Consisting of Loading machine with capacity of atleast 5000 kg and equipped with a movable head or base which enables Plunger of 50 mm dia. to penetrate into the specimen at a rate of 1.25 mm/ minute. Inside dia. 150mm and height 175mm with a detachable perforated base plate of 235mm dia. and 10mm thickness. Net capacity - 2250 ml; conforming to IS-9669:1980 (Reaffirmed-2016). 148 mm in diameter and 47.7 mm in height along with handle. One annular metal weight and several slotted weights weighing 2.5 kg each, 147 mm in diameter, with a central hole 53 mm in diameter. Weight - 4.89 kg with a drop 450 mm. IS 2720(Part 16):1987 Methods of test for soils: Laboratory determination of CBR (second revision). Reaffirmed- Dec 2016. RDSO report No. RDSO/2009/GE: G-0014 - Guidelines and Specification for Design of Formation for Heavy Axle Load. Remoulded specimen: The test material should pass 19 mm IS sieve and retained on 4.75 mm IS sieve. 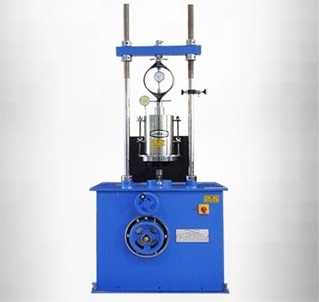 The dry density for a remoulding shall be either the field density or the value of the maximum dry density estimated by the compaction test (Heavy Compaction Test as per IS 2720 (Part-8) - 1983, for Railway Formation). The water content used for compaction shall be the optimum water content or the field moisture as the case may be. Dynamic Compaction: A representative sample of the soil weighing approximately 4.5 kg or more for fine grained soil and 5.5 kg or more for granular soil shall be taken and mixed thoroughly with water. If the soil is to be compacted to the maximum dry density at the optimum moisture content, the exact mass of the soil required shall be taken and the necessary quantity of water added so that the water content of the soil sample is equal to the determined optimum moisture content. Fix the extension collar and the base plate to the mould. Insert the spacer disc over the base. Place the filter paper on the top of the spacer disc. Apply Lubricating Oil to the inner side of the mould. Compact the mix soil in the mould using heavy compaction. i.e. compact the soil in 5 layers with 55 blows to each layer by the 4.89 kg rammer. Remove the extension collar and trim the compacted soil carefully at the level of top of mould, by means of a straight edge. Any holes developed on the surface of the compacted soil by removal of the coarse material, shall be patched with the smaller size material. Remove the perforated base plate, Spacer disc and filter paper and record the mass of the mould and compacted soil specimen. Place a disc of coarse filter paper on the perforated base plate, invert the mould and compacted soil and clamp the perforated base plate to the mould with the compacted soil in contact with the filter paper. Place a filter paper over the specimen and place perforated plate on the compacted soil specimen in the mould. Put annular weights to produce a surcharge equal to weight of base material and pavement, to the nearest 2.5 kg. Immerse the mould assembly and weights in a tank of water and soak it for 96 hours. Mount the tripod for expansion measuring device on the edge of the mould and record initial dial gauge reading. Note down the readings every day against time of reading. A constant water level shall be maintained in the tank throughout the period. At the end of soaking period, note down the final reading of the dial gauge and take the mould out of water tank. Remove the free water collected in the mould and allow the specimen to drain for 15 minutes. Remove the perforated plate and the top filter paper. Weigh the soaked soil sample and record the weight. Place the mould assembly with test specimen on the lower plate of penetration testing machine. To prevent upheaval of soil into the hole of the surcharge weights, 2.5 kg annular weight shall be placed on the soil surface prior to seating the penetration plunger after which the remainder of the surcharge weights shall be placed. Seat the penetration piston at the center of the specimen with the smallest possible load, but in no case in excess of 4 kg so that full contact of the piston on the sample is established. Set the load and deformation gauges to read zero. Apply the load on the piston so that the penetration rate is about 1.25 mm/min. Record the load readings at penetrations of 0.5, 1.0, 1.5, 2.0, 2.5, 4.0, 5.0, 7.5, 10 and 12.5 mm. 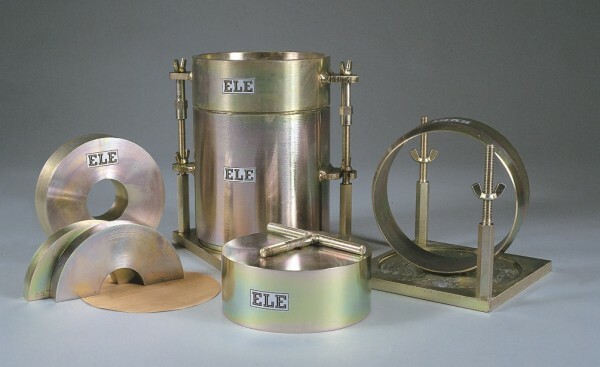 Raise the plunger and detach the mould from the loading equipment. Take about 20 to 50 g of soil from the top 30 mm layer and determine the moisture content. PS = Standard load for the same penetration taken from the table above. The C.B.R. values are usually calculated for penetration of 2.5 mm and 5 mm. Generally the C.B.R. value at 2.5 mm will be greater than at 5 mm and in such a case/the former shall be taken as C.B.R. for design purpose. If C.B.R. for 5 mm exceeds that for 2.5 mm, the test should be repeated. If identical results follow, the C.B.R. 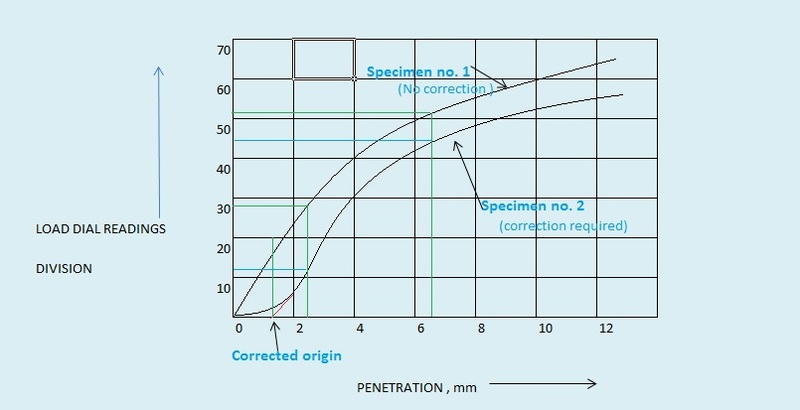 corresponding to 5 mm penetration should be taken for design. Draw graph between Load versus Penetration.